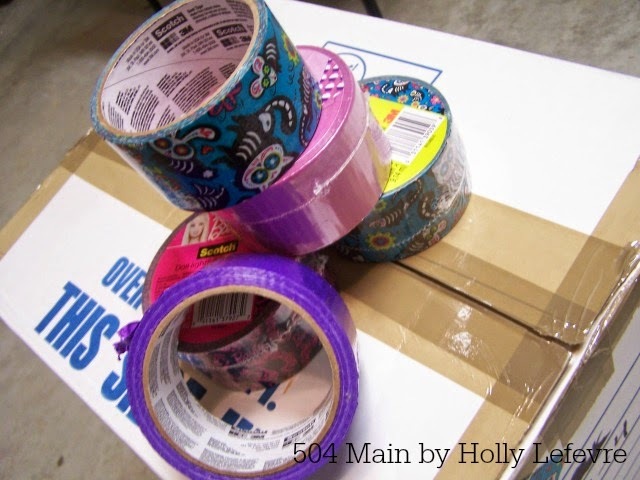 504 Main by Holly Lefevre: My Favorite Moving Tip: Just Add Tape! 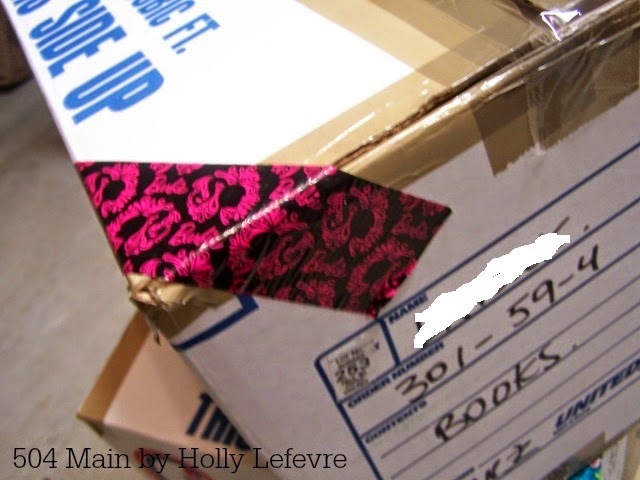 My Favorite Moving Tip: Just Add Tape! and I finally have unpacked all but 3 boxes in the garage - whew! ensure everything would end where it was supposed to or stay organized. I did some packing myself and got a few boxes from a friend - this where I learned this MOVING TIP for keeping all those (and there were A LOT) of boxes organized. It has proven to be my sanity saver! Duct Tape in a variety of colors! 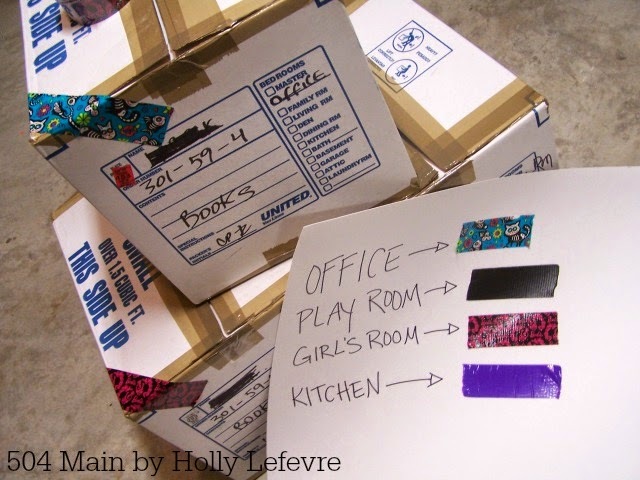 As the boxes were packed, I marked each one with strips of colored or patterned duct tape. 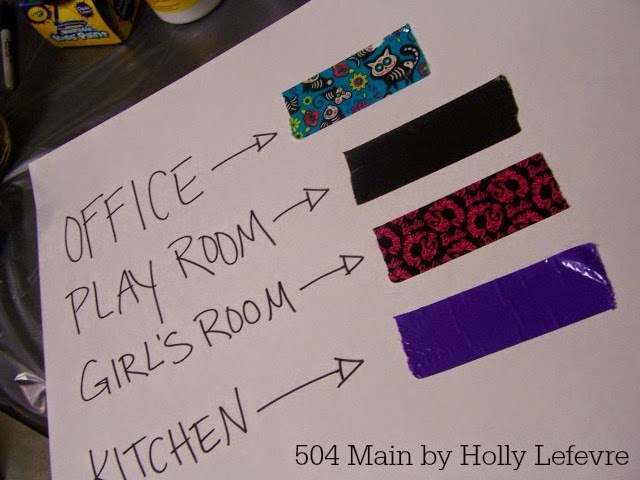 (you can use washi tape, masking tape, or a combination of tapes). Our movers left the boxes in each room over night, so I had time to do this. We designated one color/pattern for each room. Try to not use tapes that are too close in color/pattern. For example I had two tapes with black backgrounds and bright designs, but they looked too similar, so I just used one of them. On each box, a 6-8 inch strip of duct tape was placed on the top corner or side. I tried to put the tape diagonally across the top, with it overlapping onto 2 sides so that the tape was visible from at least 3 directions. I always made sure the color showed on the side where the movers markings were (which room or contents). Our movers liked to use their own markings for packing and placing the boxes...and they always asked us, but I did make a legend. On a giant poster board label each room and place a piece of duct tape next to it. Doesn't get much simpler! It was also super easy for everyone to know which box went where. If you have ever moved, you know it can get CRAZY as boxes are unloaded, especially toward the end of the day...and this helped on stay organized. but it was close and really easy for us to stay on task with this simple TIP! Do you have a good moving tip? That is a clever idea to color code with tape. We have lived in our home for more than 30 years so I don't have any moving tips to share. How To Stain or Dye Concrete Floors: The Results!